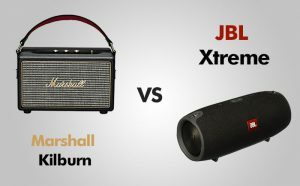 Today, I will review two Bluetooth speakers: Marshall Kilburn and JBL Xtreme. Marshall is a company that is famous for making high-quality amps and speaker cabinets, but they also create consumer products, such as headphones and loudspeakers. The second company is JBL, a well known in the consumer market. Their primary products are speakers and headphones. The speakers from both companies are about the same price, so which one should you go with? Check this comparison to find out. It comes with two versions black and cream. 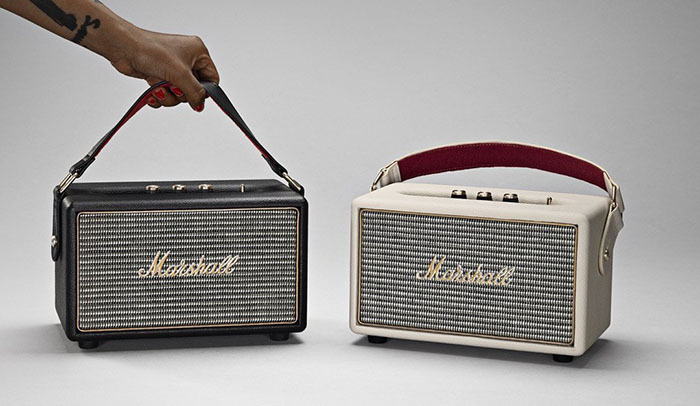 Kilburn is an attempt to merge old vintage Marshall design with the new wireless technology. And I have to say It worked out pretty well. Its design is very similar to other non-Bluetooth speakers from the same company. There’s a nice mesh grille in the front with the fancy vintage Marshall logo and tolex (which imitates the leather) covering the speaker. But that’s not all when it comes to vintage design, Marshall added a few extra retro features like red diodes, input, three analog knobs, two buttons and a switch. Marshall comes with a high quality, guitar style AUX cable with a gold-coated plug for people who don’t want to use Bluetooth and connect it with an auxiliary cable. Marshall Kilburn is probably the toughest-built of all Bluetooth speakers I have tested. All materials used in JBL are tightly assembled. It’s also rain and splash proof, so you can get away with some rain, but don’t try to drop it into a pool. The JBL Xtreme is well built, but both passive speakers on the sides are entirely exposed and you have to be careful not to damage them. At the bottom, JBL is equipped with the rubber feet to prevent the speaker from moving around. The inputs are hidden behind the orange zipper in order to protect them from water splashes. It’s a bit tight especially when you use it for the first time. But after a while, it loosens a bit. JBL Xtreme can be oriented vertically, but it’s pretty clear that it’s not intended to, especially when you have passive radiators on both sides of the speaker and you will block one of them if you use it that way. On the bottom of the speaker, you will find small indicator lights that let you know how much battery power is left. Both speakers are officially portable. But they are heavy – JBL weights slightly more than 2 kg and Marshall weight 3 kg. For that reason both speakers come with a strap, so you can carry them like a bag. The Kilburn features a 4-inch woofer in the middle and two 3/4 inch tweeters. They reproduce sound properly without too much distortion even at high volumes. It sounded well with almost all types of music genres. I got a pretty punchy bass and very crisp treble, sounding universally great. This speaker can compete with many bookshelf speakers, especially at the low end. It sounds pretty good without a subwoofer. Of course, if you want the bass to truly shine, especially in a larger room, you should buy a sub. JBL has two external passive radiators to work on the low end and make a better bass, so even people who prefer bass heavy songs won’t be disappointed. On the high end, the melodic guitar parts never collide with vocals. At least, if you keep your volume at a reasonable level. If you turn the volume too much you will notice a bit of harshness. But luckily the Xtreme gets really loud, so probably you won’t have any problems with that. JBL offers a great feature called JBL connect. Now, you can connect two JBL speakers and play them in the stereo mode. It’s especially great outdoors where you don’t usually hear the stereo separation in such a small speaker. I would recommend both speakers to anyone who listens to EDM or other bass-heavy music. When it comes to the high end, Kilburn provides a very good sound quality, but the Xtreme is slightly better at separating voices and instruments at various volume settings. Some people complain about Bluetooth reception in both models. In my case, it’s non-existent – I didn’t have any problems with it. With Kilburn, I was able to go outside the house and maintain the connection from 50 feet. So, if you stay within this range you shouldn’t have any problems. I noticed a few people complain about the ‘lag’ between songs. But I haven’t found it to be a big issue for me. None of the speakers have NFC (Near Field Communication) communication for easy pairing which is highly convenient for Android users. Kilburn has built-in batteries, which are user replaceable and at 50% volume, they last for 20 hours on a single charge. Unfortunately, the speaker doesn’t show the battery life before it goes down to about 20%. I was able to get around 15 hours before I even saw anything. I’m not really sure how much juice left, but it usually got 15 hours out and I’m sure it can get about 18 to 20 hours. There is no USB charging, this means that you can’t charge this speaker using a micro-USB cable like you would do with many other speakers out there. There is also no output for charging other devices, so you can’t use it as a power bank. JBL Xtreme has a huge 10,000 mAh battery which can be powered for up to 15 hours. With my own testing, the Xtreme played constantly, at 50% volume, for about 18 hours. Charging from a dead battery to full lasts about 3.5 hours. Xtreme can also be used as a power bank It can charge up to two devices such as smartphones or tablets, playing music at the same time. PROS: Good sound quality / Analog bass and treble knobs / Stylish vintage design / Beautiful AUX cable / Long battery life. PROS: Great sound quality / Power bank / Long battery life / Splash-proof / JBL connect. CONS: Not waterproof / Weak battery indicator / No SD card slot / Heavy. CONS: No SD card slot. Xtreme comes as a winner, but Kilburn is not far behind. 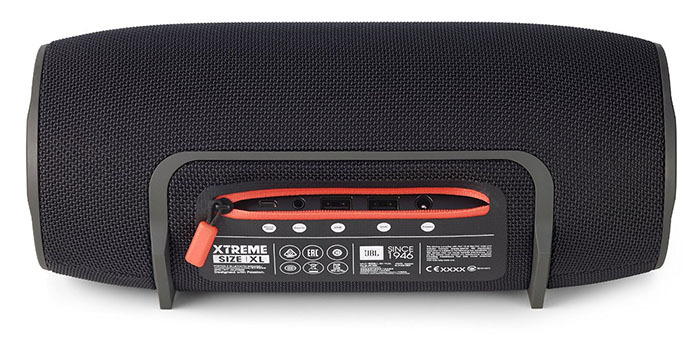 Both speakers provide very good sound quality, but Xtreme is better at filling a room with voices and instruments at different volume settings. The Kilburn, however, is toughest build speaker, and the control knobs and switches give a lot of satisfaction to use. The sound in Kilburn feels more directional than in Xtreme, where listening experience depends more on the position of a person.